America's Fabulous Freelance Insurance Investigator faces cases of killing for vengeance and keeping silent for honor�"dead" men who won't stay down for long (or alive for much longer)�beneficiaries that can't be found and beautiful mixed up risk-takers who may be out on their last ledge. He pads his expense account in pursuit of stolen jewels, arsonists, crooked cops, and romance, all while he tries to solve matters of murder. 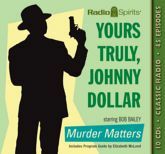 With a versatile voice that projects just the right air of tired world-weariness, leavened by just the right tone of compassion, and just the slightest edge of cynicism, Bob Bailey stars as Johnny Dollar in four half-hour episodes, seven 5-part serials, and one 6-part serial. Includes 45 digitally restored and remastered episodes, and a Program Guide by Elizabeth McLeod.